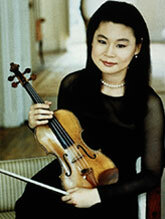 On Monday, November 1, Midori gave a two and a half hour master class for SAW and UWM students. What a thrill! Six students performed for her and she got right to the point with each student offering them suggestions for a more convincing performance. Performing were Sarah Kapustin with the 2nd movement of the Wieniawski D Minor Concerto, Meghan McGowan with Introduction and Rondo Capricciosso of Saint-Saens, Eliza Hamner, first movement of the Bruch G Minor Concerto, Katharine Gorsuch with Poeme by Chausson, and from UWM, Jerry Loughney with the first movement of Mozart’s 5th Concerto.